Is Arizona shifting to the political center? Does Sinema's election send a larger message? Is Arizona becoming less Republican and more Democrat or is this latest election just a temporary shift in Arizona's political personality? So what do Kyrsten Sinema's win Senate and victories for other Arizona Democrats say about our state? In her victory speech, Senator-Elect Kyrsten Sinema urged Arizonans to step away from combative us versus them politics and pull together for the good of the state. She told supporters: “We can work with people who are different than us. We can be friends with people who are different than us. We can love and care about people who are different than us. We can keep people who are different than us safe. We can be good people who care about each other even when we disagree." The Democratic Party may be strong in Pima County but Arizona has been reliably Republican on a statewide level. 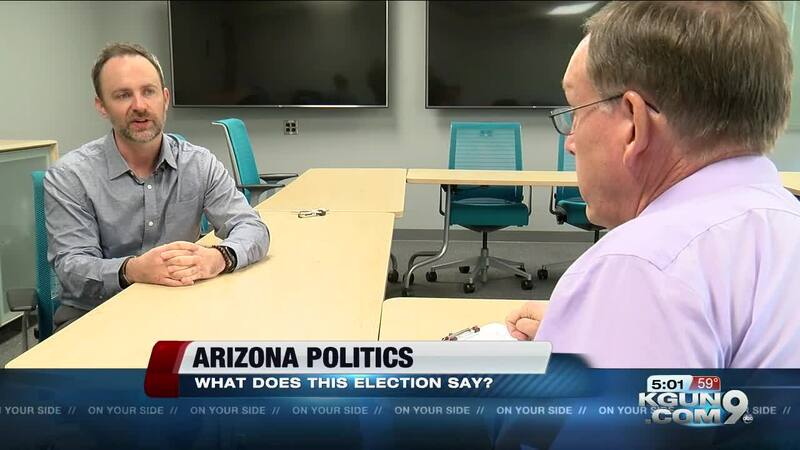 Associate Professor Christopher Weber of University of Arizona’s School of Government and Public Policy says Arizona may be moving to the center in a world of hard right and hard left politics. "But at the same time, we've had two senators who have have often challenged authority within their parties. And so it's hard to say whether this is, you know, a moment of change in that the parties or the state is, you know, moving in a different direction, or whether it's sort of speaks to Arizona's independence." And he says some of the power seems to be swinging away from rural voters to voters in cities and suburbs. Weber says, “What we saw on election night, you know, a week ago was suburban females largely moved to the Democratic side and so there seems to be a nationwide a division growing between suburban and urban voters relative to rural voters." And Weber says trends show up more quickly in races for the House than the Senate because elections for the House are every two years while Senators go six years before they run again.